I stitched up this panorama a while ago, but I wasn't sure if it was worth posting. 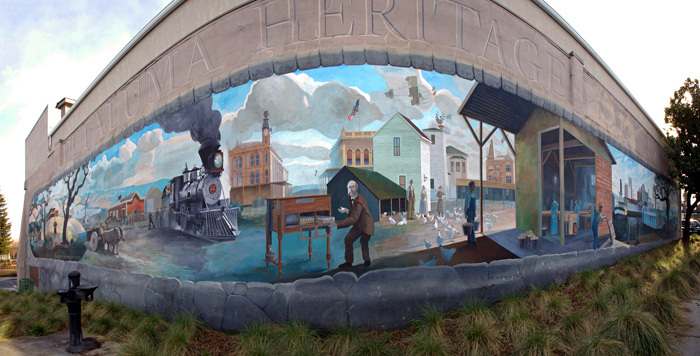 I found this mural in Petaluma, California after visiting the TWiT studios last month. This photo makes me want a fisheye lens (even though I feel like they are kind of gimmicky), especially since I now have a full frame body. This is a good time to transition to a new "format" for this blog. Since I haven't been doing the daily thing for quite some time anyway, I'm just going to randomly post photos I've taken, regardless of when they were taken. Edit: I just noticed a glitch in the stitch. Do you see it? Great photo and I'm glad you're doing your blog in a different manner. I always enjoy your photography. Better watch your heritage from now on. Haha. Thanks Norm. This new way will allow me to post photos even from before the blog started.